Poster, 1965 / 66 Season Poster, 1965. Designed by Armin Hofmann (Swiss, b. 1920) for Stadttheater (Basel, Switzerland). Offset lithograph. 128 × 90 cm (50 3/8 × 35 7/16 in.). Gift of Ken Friedman, 1997-19-144. American designer Dan Friedman was a student of Swiss master Armin Hofmann in the late 1960s. Friedman was working at Anspach, Grossman, Portugal, Inc., when the firm secured the account for the new Citicorp identity. He designed Citicorp’s logo and other key elements of the brand campaign. 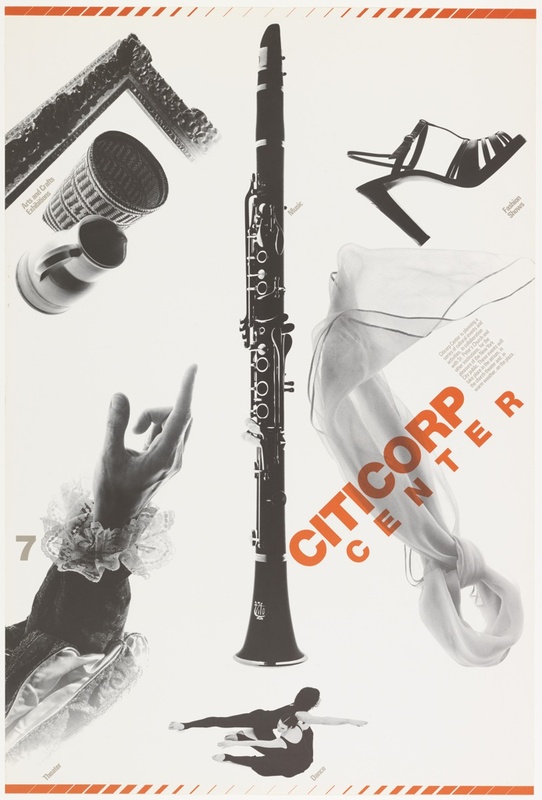 His poster for Citicorp Center, advertising Citicorp as a venue for cultural entertainment, pays homage to Hofmann, whose poster Stadttheater Basel 1965–66 may have served as a model. Friedman’s own copy of Hofmann’s poster turned up in the Dan Friedman Collection, donated by his brother Ken Friedman in 1997. That gift includes numerous works by Friedman as well as works by other designers he knew and admired, including Wolfgang Weingart and April Greiman. Poster, Please Please Me, Anyone Will Do, 1977. Designed by April Greiman for Pacific Coast Films (Los Angeles, California, USA). Offset lithograph. 88.4 × 59.7 cm (34 13/16 × 23 1/2 in.). Gift of Ken Friedman, 1997-19-286. Poster, NR. 4, 1974. Designed by Wolfgang Weingart for Kunstgewerbeschule (Basel, Switzerland). Letterpress. 87.4 × 61.7 cm (34 7/16 × 24 5/16 in.). Gift of Anonymous Donor, 1997-19-140. April Greiman studied with Weingart in Switzerland in the late 1970s. She revolted against the hyperrational “international style” of Swiss modernism. Like Weingart and Friedman, she sought looseness and complexity within modernism’s abstract visual language while maintaining a strong interest in systems and structures. Diagonal elements became a hallmark of her methodology. The lines in this early work by Greiman cut violently through the composition rather than lead the eye through a carefully orchestrated journey.